Currently showing the story "Sailing to the Sea of Cortez". Click here if you want to see the full list of stories available. A long trip up the inside coast of the Baja Pennsula where we see lots of sea-life, climb canyons and volcanos, and do a lot of sailing with our friends. We finally left Mazatlan after several attempts. The first failed attempt was autopilot related, the second was caused by the dredge blocking the channel, and on the third attempt, we escaped (though barely - a set of 3 freak waves broke across the entrance right as we were heading out of the harbor - scary!). Our goal for the summer is to run like a scared chicken from hurricanes. Hurricane season is from May to November, with most of the nasty ones heading into the Sea in late August thru early October. 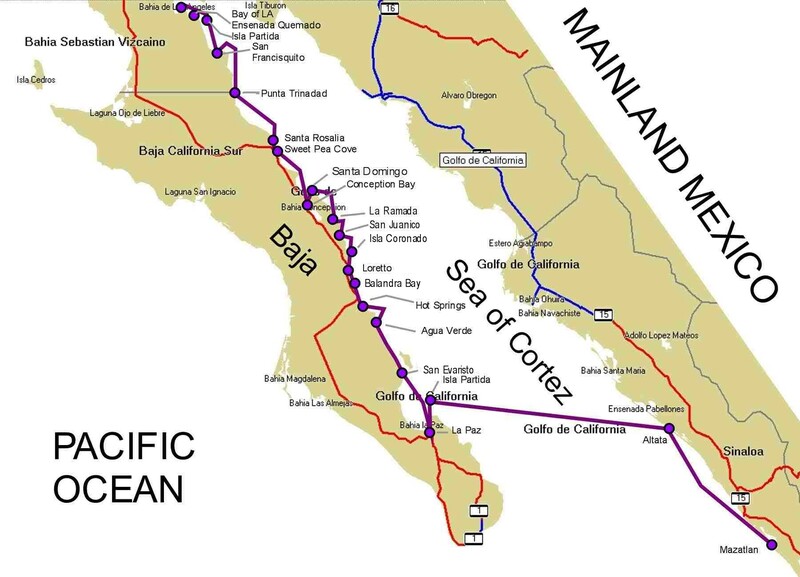 The following picture shows all the tropical storm tracks over the last 150 years to reach as far North as Baja. 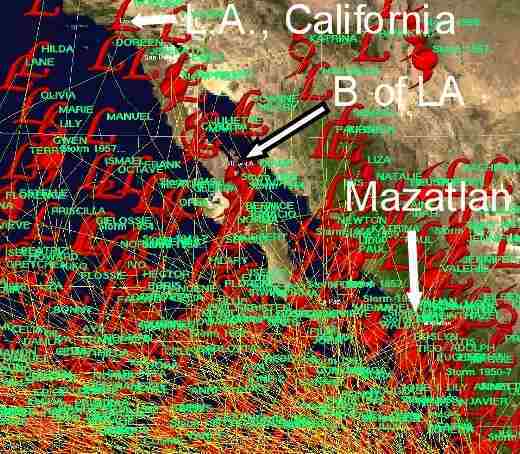 You can clearly see the hundreds of yellow tracks south of Baja which gives you an idea of why we moved north. It's probably not too hard to see why Bahia de Los Angeles (B of LA) is a good place to summer. Most of the hurricanes that head that way have to cross land, which burns them out quickly, or cross over an area of deep cold water in the Sea, which has the same effect. There's a great anchorage called Puerto Don Juan just 5 miles from the village in which many boats have ridden out occasional hurricanes &tropical storms safely. Anyway, enough of that talk. No hurricanes this year, right! The trek North from Mazatlan is a long haul of about 800 miles according to our GPS's odometer. All the places we visited won't fit on a picture that fits the screen, so you can click on the map below and zoom into it to see the places we went. First off was Altata. This town is uncharted and unmarked, requiring the crossing of a shallow bar to enter the long narrow bay (technically a lagoon). We got instructions from other boaters that had visited there and were able to cross the bar and find the entrance. It sounded like a great spot to stop because it was about half way between Mazatlan and Isla Partida over on the Baja peninsula. However, it was not to be. There were large breaking waves all across the bar for miles and miles. We tried to cross twice, the first time we came close to getting washed up on the beach, with a 10 - 15 ft. breaking wave. I won't go into the details about it here, as we talked about this little experience in great detail in our SLOG if you want to read about it in the archives. Aborting Altata, we settled in for another night at sea as we crossed to Isla Partida. With no wind, we continued to motor for another 24 hours. At which point we promptly ran out of diesel. We apparently had an air blockage in our vent when we filled up in Mazatlan. We thought the tank was full, when it wasn't. Our fuel filters also picked up all the gunk from the bottom of the tank, so we replaced them, refilled the tank from our jerry cans, bled the engine (several times) and crossed our fingers we could make landfall under power, as there was no wind. Naturally we made it in fine style, although bumming 5 gallons in the anchorage knocked down our pride a notch or two. Nonetheless, we shook it off and enjoyed Isla Partida immensely. It's a beautiful little island. The clear water and bright red cliffs were stunning. We spent several days relaxing and waiting for the strong southerly winds to calm down so we could head south to La Paz, where Sherrell's mom was going to meet us for a visit. La Paz is like a little San Diego in Baja. A nice town, but it's been "Gringo-ized" from the large influx of retired Americans who live there. What we do like about La Paz is being able to anchor for cheap in the protected bay, right on the edge of the city. Convenient and cheap. There is also a bit of wilderness surrounding La Paz, on a large spit called the Mogote, but it's under threat of being turned into a golf course. Sigh. Ok, so La Paz has some culture too. We watched a belly dancing performance and saw an art show dedicated to Don Quixote. There was also a pod of dolphins who swam in and out of the harbor for our personal entertainment. We also found a great vegetarian restaurant which was a real bonus! We spent 3 weeks in La Paz and it took us all that time to work out the logistics of getting Sherrell's mom from the airport 100 miles way, to La Paz, then sailing with us to the next town North (Loreto) where she would bus back down to the airport. A complicated task to plan out when you aren't fluent in Spanish. Everything worked out ok. We rented a car and drove down to the airport to pick Sheila up. Other than waiting at the wrong terminal for a 1/2 hour, it went smoothly. Once back in La Paz, we had a nice dinner out, then packed up the boat to depart the next day for Isla Partida. There are 4 or 5 anchorages to choose from, but this time we decided to go into the bay we first visited on Sherrell's dad's boat, Soul Coaxing, 10 years ago. It lived up to our memories, and was as beautiful as the first time we saw it. With some beach combing and swimming under our belts, we spent a day relaxing then took off for San Evaristo, further north. Since we only had 9 days to cover the 120 miles, we kept chugging. San Evaristo is a pretty good anchorage, but it's small. With the winds howling from the West, it was the only spot that was protected from that wind direction. We sailed hard in the lumpy seas -- too hard. Sherrell's mom promptly puked all over me while I was steering. Fortunately I can move faster than projectile vomit when necessary. Some skills learned in college still come in handy! I was only slightly grazed, but I leapt so far and fast Sherrell thought I was going to jump out of the boat! Getting anchored in the bay sort of calmed everyone's nerves, and returned everyone's stomachs back into normal working order. So we went for a hike on San Evaristo's beach. A beautiful little spot well protected from the Westerly winds that blast down the mountains at 20 to 40 knots at night and early morning. These winds are locally called Elephantes but they are really just Katabatic winds which we also encountered in Northern B.C. and Alaska. After catching our breath here, Sherrell's mom took some seasick pills, and we weighed anchor. Unfortunately there was no wind for a romping good sail. We motored along on flat seas. The pills, however, knocked Sherrell's mom out cold. She slept for a good 6 hours while we puttered our way up to Agua Verde. Along the way, we were able to roust her out of her chemical coma to see some playful dolphins show us how things are done in their water world. But we kept on moving North when they veered off looking for more exciting things to do and Agua Verde was calling us. Lots of people love Agua Verde and we added our names to that list. It wasn't very crowded, and we met up with some old friends whom we had met coming down the Pacific Coast: Loon III, Icarian and Komara. It was a great spot for swimming, hiking and enjoying the high life. The other boats with us told us about a hot springs they planned on stopping by on their way North. It sounded pretty good, even though the weather was quite hot on its own. So, after three days of Agua Verde, we followed them to the salty springs. The water was too hot for me, so I snorkeled around the reef which was filled with all kinds of tropical fish while the others chilled (?) in the hot springs. But our deadline was marching forward. Sheila had a plane to catch, and doing it by bus meant we had to plan for some extra days to get things setup. 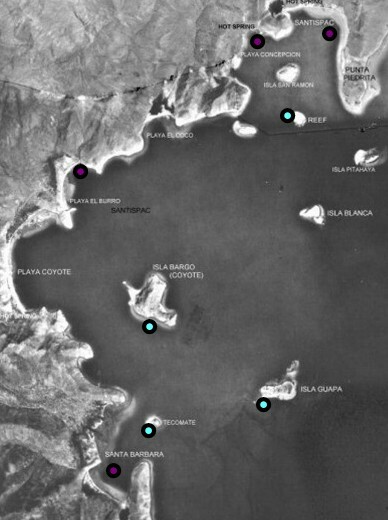 So while the other boats stayed the night, we pushed on to Puerto Escondido (closest protected anchorage to Loreto). We found the harbor manager very helpful. I spoke with him in broken Spanish, and he called the bus company for us. Since we were 15 miles from the bus station in Loreto, we arranged to have the bus stop at a spot on his way out of town, where Sherrell and her mom could be picked up. The next day we hauled the luggage out about 2 miles to the highway and as if in a scene from an art film, we sat on the empty desert road with the bags, waiting for the bus. Amazingly enough, it worked and the driver stopped for Sherrell and her mom at the side of the road. The bus ride was 5 hours to La Paz, so the plan was for them to stay the night at a hotel in La Paz, then Sherrell would return via bus to the boat, and Sheila would travel on to the airport (100 miles south) by another bus. It wasn't eventless. Sherrell's mom almost missed the plane for various reasons: bus broke down, departure time was earlier, etc. But in the end it all worked out and everyone will have fond memories of swimming, shelling and of the sunsets in Baja. Well, this was by no means of the imagination an end to our little trip north. We had to get out of the hurricane belt and keep pushing north. But we stopped to smell the cactus and spent a week in Puerto Escondido where we hiked the Arroyos, shopped (really we waited to see if either of the two tiny stores would suddenly get a new shipment of fresh produce) and rested. As you can see, the arroyo was quite a hike! It was filled with birds, cliffs, trees, plants, rocks, sand and even puddles of water! Some of the spots were tough to climb, and even required dragging our bodies up through cracks. And the cliffs were spectacular! After stretching our legs (and several other parts of our bodies) we left Puerto Escondido, and headed for Puerto Balandra on Isla Carmen. Another great sail, we did 6+ knots with a double reefed main and genoa. Balandra was muy bonito, with the obligatory white sandy beach, where we hiked a bit and Eric did some snorkeling. After a couple days, we needed to re-provision, as the produce in Escondido was mostly rotten. The town of Loreto is just 10 miles across the passage so we headed over oh-dark-thirty in the morning and anchored in the open roadstead off the town. We had kept in touch with Icarian and Loon via VHF radio and arranged to rendezvous in town for a day of shopping. While cruising on a sailboat, getting supplies means playing human pack mule. We lugged all our groceries around town, searching for the freshest of the fresh produce. Like ancestors of the past, we found the coldest beer and the best tomatoes and avocados and lugged them back to our floating caves. Eagar to depart for the protected anchorage of Isla Coronado, we bolted from the town and made for the Island, with Icarian and Loon close behind. Only 7 miles away, we were able to anchor and open a beer before they had a chance to warm up. What a beach! Clear water and the local rays pop up like jumping jacks and perform flips and belly flops to show us how cool they are. We couldn't leave here very quickly, so we spent a few days enjoying the sights, and just relaxing, before moving on. We had gotten another case of strong Westerlies in the early morning, which is a little dangerous for this anchorage, so we opted to move to an anchorage called La Ramada, a little bight about 20 miles north. Unfortunately, the wind died once we were underway - no wind meant no sailing. Arriving in this little cove, we found Loon and Icarian packed inside, almost on the beach. We squeezed in and we all went for a hike to look at another very popular anchorage, San Juanico, on the other side of the isthmus. The couple on Loon took a nice set of panoramic photos of San Juanico which are below. It's one big bay full of islands and reefs, but the weather hadn't been making things easy for us. During the night in La Ramada (just north of San Juanico), we were hit with strong westerlies -- very strong. Sherrell and I were on anchor watch most of the night because in this little bay there was no room to drag anchor. The next day a northerly swell rolled in and rocked everyone from rail to rail. So we decided to bail south to San Juanico. We'd try our luck with the waves and wind there. It was only slightly better, though there was a lot more room to drag if necessary with the westerlies. We spent three days getting pummeled by waves in the afternoon winds. Like clockwork, we would leave our boat and camp out on the beach and watch from a distance as the boat bounced like a toy. Sure we felt sorry for the cat, but someone had to man the boat. With beaches and water like this (nice and calm in the morning), who couldn't tolerate 5 or 6 hours of a bucking bronco? Well, after three days, we couldn't. In fact we'd had enough of marginal anchorages and decided to do a 66 mile passage into Bahia Concepcion (Conception Bay), the nearest protected anchorage. So, saying goodbye to our friends, who didn't bounce as much as us (bigger boats and all), we headed north. Leaving early we were able to put those Westerlies to good use and get some sailing in, fast hard sailing. But it died by 10 am and we motored the rest of the way in pretty calm winds. We toured the beaches, checked out the 3 tiny stores and basically saw everything. The bad thing about being deep inside this bay was the heat. To read for yourself what the heat did to my brain, see our SLOG for the Oceanic Heat poem. It was hot, but it was also beautiful. We hitched a ride into Mulege, the nearest town, to find some produce that wasn't brown and inhabited by flies. Hitchhiking into town was easy, we caught the first car going by. But getting a ride back was tough. People kept pointing down towards the road or off to the left or right, as they passed us by. We didn't know this was a cultural signal for, "I'm not going far, sorry." I guess they didn't know we only needed a ride to Conception Bay, and not Loreto or some other distant town. The owner of one of the restaurants at Bahia Concepcion saw us on the road and picked us up where we rode in the back of the pickup along this dusty stretch of highway. Phew! No sleeping in a ditch for us. 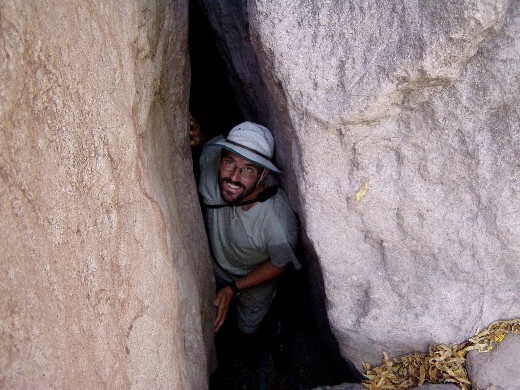 Once we got back, our friends Loon and Icarian arrived and we planned to tour some of the caves and arroyos around Mulege. Together we hired a guide to drive us to the middle of the desert. He taught us about the medicinal values of the different plants, where to find water, and how to survive in the heat. One cactus he showed us was at least 700 years old. And he showed us petraglyphs and pictographs which have been dated back several thousand years. And to top it off he also took us shopping in Mulege for more produce (always an on-going activity) and returned us to the beach. All in all an excellent side trip! We tried to spend a few more days in the bay, but the heat eventually chased us out. Sherrell and I were getting worried about handling the summer in the Sea of Cortez, because it was only June, two months away from the "hottest" time in the Sea. How could we possibly stand more heat? The temperature in the sun hit 125F one day! AGGGHHH! Luckily, as we anchored by a spit called Santa Domingo, just inside the entrance to the main bay, the temperature dropped substantially and both the air and the water were tolerable, even a little chilly at times. Our friends were chiding us about the heat, because they were both returning to Canada for the summer (like almost everyone). It seemed that we were among the 5% of the cruisers headed north for the summer season. As things turned out, Conception Bay was the hottest spot we ever encountered. To cool down a little, we all gathered in the afternoons amongst the boats on anything that would float. We dubbed it "floaty time". It was a way to expend no energy in an effort to drain away some of the heat. It was also just plain fun. I'm in the big green ring trying to look into the sun and Sherrell is busy taking the photograph. So after cooling our heels, we departed for Sweet Pea Cove on Isla San Marcos. The cove is really only a large bight on the west-side of the island, and is named after a cruising boat that was sunk there during a hurricane. Comforting, isn't it? Actually, this turned out to be a very relaxing and well protected anchorage for the predominant SE winds of summer. Nearby, on the north end of the island is a spectacular spot called Los Arcos (it means arches or rings). Los Arcos has lots of sea caves, arches and pinnacles. We dinghied over there in Loon's dinghy first, and scrambled our way in and out of some hidden rock caves as well as the more popular caves. The next day we moved the big boats over for a fun-filled day of snorkeling and cave exploring. The arches were cool too! Our camera could only record a fraction of the beauty here because there was a lot to see underwater. There was even a cave we could swim through and pop out the other side of a tall cliff. What more could you ask for? Well, you might be thinking produce or even fresh water. And you're right! So after about three days or so in Sweet Pea cove, we were off to the town of Santa Rosalia, mostly to refill our fresh water tanks. Santa Rosalia is most famous for the church built by Eiffel (of the Eiffel Tower fame), as this used to be a French mining town (yes, French not Spanish). We toured the town, scoped out the stores, bought veggies and after many many questions, found a vegetarian restaurant. Amazing, eh? It was in someone's house with no signs or anything. Inside they had a little health food store and they cooked our dinners to-go right there in their kitchen. It was delicious! They even gave us a 1/2 gallon of ice cold Jamaica ("hum-i-KAH") tea (like cranberry juice but made from hibiscus flowers) to go with our dinner. HEAVEN! The drawbacks to Santa Rosalia? Well, two things. First, the harbor was a center for about 200 panga's who went out every night to catch about 1000 to 2000 pounds of squid (we're talking the huge 3 to 6 foot variety - no lie!). Talk about smelly! And the anchorage was awash with wakes from these guys who go full speed everywhere. The other thing was that the harbor itself was very polluted and murky due to the old mining operations, so we couldn't jump in for a dip when it became unbearably hot in the afternoon. Then there was Jezebel. Since Mazatlan, she had gotten progressively worse coughing up hairballs and vomiting. While we were in La Paz, we had a vet take a look at her and run a blood test. After much manipulation with the numbers (changing units, etc.) he decided she was hypothyroid. Our vet in Seattle seemed to think this was almost impossible, as it is extremely rare for cats to become Hypo-thyroid (Hyper-thyroid, yes, which is the opposite problem) especially since her last blood test there showed her thyroid levels as perfect. Not knowing what to do, we decided to do nothing. Especially because we really didn't have many other options. However, she was getting thinner, and vomiting almost every day. And by chance we found a vet in Santa Rosalia operating out of the front of his house. After translating the problem in Spanish, and writing it up, we approached him. He was very good and we were impressed with his concern and sincerity in helping find the root cause of Jez's trouble. So we brought her back in for blood tests and an exam. He was much more thorough than the guy in La Paz and he was careful to look at all the possibilities and consult with other vets too. He agreed with our Seattle vet that the thyroid was probably not the problem, but nothing else really showed up in her blood results. It all boiled down to doing an exploratory surgery. Reluctantly, we agreed. It was the only way to find the cause. After opening up little Jezebel, he found her intestines blocked with no less than 10 hair balls! Most or all of them had been there for over a month (we had cut her hair 4 weeks earlier, and he found very long hair packed into these hairballs). So he had to cut her intestines in 3 places to get it all out. He stitched her back up and sent her home with us. We watched over her like a hawk as she struggled to come back to her senses. She had a 3 inch long incision and eyes dilated wider than the moon. She staggered everywhere. We stayed up all night with her in shifts, trying to relax her (she was agitated coming out of the woozy stupor) and keep her from hurting herself. It was tough. Eventually she got better and better and started eating again. We had to wait 10 days before leaving just to make sure she didn't get a secondary infection and to have the stitches removed. In the meantime, we waited in the smelly squid gut harbor of Santa Rosalia (we're anchored to the left in this photo). The good thing about this harbor is we could anchor and just pay a small fee to land our dinghy each day. So it kept the cost down for us. We were also able to borrow a sewing machine from one of the other cruisers and we made some shade covers to keep us nice and cool. Eventually the day came for Jezebel to get her stitches out. She was eating normally again and pooping up a storm - definitely on the mend. We were so happy we almost burst. Santa Rosalia is an old copper mining town. The mine shut down for good about 30 years ago (the main operations shut down in the 50's), but they still have all the old equipment around, and a pretty cool museum with lots of old photographs. They used to haul some of the copper ore to Tacoma, Washington (near Seattle) and bring the empty sailing ships back filled with lumber. The French preferred to build the town and their houses with wood rather than using the resources of the desert around them to build brick, adobe/stucco or cement buildings. So in a strange sense all the wooden buildings around the town are like a small piece of the Northwest, and very unique to coastal Mexico. Here's one of me in front of one of the old mining trains - notice the old wooden house in the background. Now it was time to move on. We decided to stop at Punta Trinidad an exposed anchorage about 45 miles north. It was about the only spot you can stop until you reach San Francisquito, 77 miles north of Santa Rosalia. Not wanting to do an overnighter, we decided to risk the open anchorage. On our way out though, we discovered our new starting battery (purchased in Santa Rosalia) wasn't working right. It worked sporadically. Since we didn't know the cause, we returned with our tails between our legs, anchored next to the docks, and started debugging the problem. A loose cable! Bingo, back in business. Sometimes the easy fixes are hard to find, but it sure beats problems with starters, solenoids and faulty batteries! Off again the next day! Arriving in Punta Trinidad after 8 hours of great sailing in increasing seas, we anchored in some rather boisterous conditions. A boat we had met in Santa Rosalia, Solmate was anchored there, sort of in the open part of the bay, rocking and rolling like a cork in a washing machine. We tried to duck in further behind the point, but it was rough. And the wind started to blow and blow. Sheesh. So we were up most of the night watching the boat, watching the waves, waiting to leave. Yuck. So much for not having to pull an overnighter! When we did leave, it was blowing pretty good. So we struck our sails and averaged 5+ knots all the way to San Francisquito -- a beautiful bay. Our camera isn't as good as Loon's, but the panorama gives you a good idea of the bay. We hiked around, snorkeled, and basically spent a week in this protected little bay sleeping off the effects of Trinidad. While we were there, we got hit with a squall that blew pretty hard, but being protected in the bay we just took all the covers down and held on. As we moved further up in the Sea of Cortez, we started getting more and more tidal effects. Sometimes we got into some serious Pacific Northwest style current. Leaving San Francisquito, we hit 9.4 knots over the bottom (roughly 4 knots of current.) 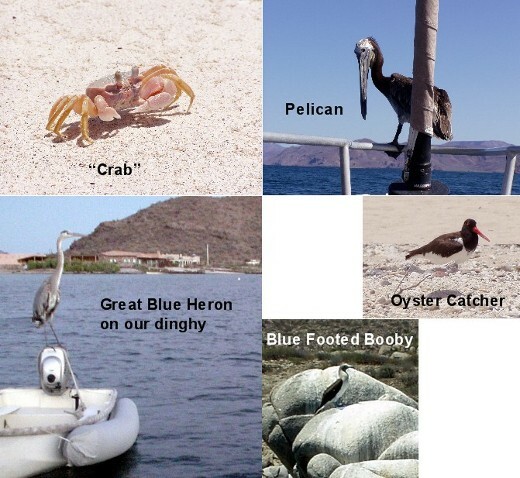 In these high current areas, lots of animals like to gather and feed. It was here, in the tide rips that we found 1000's of Pacific White-sided Dolphins. They weren't interested in us at all, but they just kept swimming through the current in large packs of about 40 to 100. As far as we could see, dolphins everywhere! It was really fun to watch them playing with each other. And then out of the depths came a massive whale! Breaching the water, it flung itself high in the air, crashing down like a 100 ton bomb sending waves and water everywhere. Stay away from that bad boy, we thought as he was busy showing off for another whale nearby, which was probably a female. He kept breaching over and over. I couldn't stop watching long enough to get the camera ready for a photo, it was just too cool to miss. After the wildlife show, we anchored in Isla Partida (not the one by La Paz). It was a cliff lined little cove about 20 miles from the Bay of LA our final destination. We spent two nights swimming, and enjoying the scenery before heading to Ensenada Quemado ("KAY-mado"). Another fairly protected bay, Quemado was a great place to stop. There was a great hike up a nearby mountain and we also crossed the sand spit to La Unica, a simple hut style resort where some guys from Tijuana bought us our first cold beers in weeks. Impressed with our ocean voyages and tales of sailing Mexico, no doubt. From the top of the mountain I tried to take another panorama. I feel sorry for all you people having to view these things on your computer screen. These poor photos are all I can do to try to convey the true expanse of these places. Hopefully you'll get the feel for it. Here's one of Sherrell on top of the world. Great beach, great hiking and almost all to ourselves! Oh my. We spent three nights here just checking it all out. Then we pulled up anchor to enter our final home-base destination (and get more produce): BAHIA DE LOS ANGELES! Yeah! Bay of LA, we made it! The best part is we aren't dieing of heat stroke, the cat is healthier than ever (maybe a bit TOO active now), and we are near a safe place to hide from hurricanes. Which by the way, is up to number 6 and 7 for tropical hurricanes in the NE Pacific, Fernanda (a female) and Greg and a new one, not yet named, as I write this. We expect to see about 7 to 10 more, but so far they have all been far far away. Our next story will most likely be about our summer up here in LA Bay. There's lots of islands to explore and the town has everything we need, water, ice, veggies and fuel. Before we sign off, here's a collage of a small slice of wildlife that we and Loon captured on camera! We never found time to write a story about our summer in the northern part of the Sea, but it was one of the best times we've ever had cruising. The water was warm, there were tons of animals around, and we made lots of friends. We only had one serious hurricane scare in late September to early October. That was hurricane OTIS. 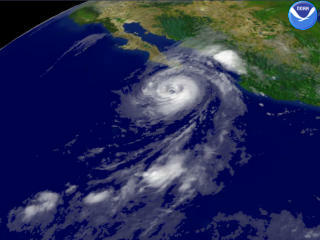 You can see it in the photo steaming it's way toward us in Baja. All the boats hunkered down in Puerto Don Juan the hurricane hole and waited and watched to see what would happen. Despite the scare, it never made it over the top of Baja and we didn't even get any rain. We were glad to see it go away, along with the 2004 hurricane season. We did a lot of sailing and hiking up there. We'll never forget our time spent in Northern Baja it was our own private slice of paradise.